If you’re a huge fan of the Harry Potter books and films, then you’re no doubt all over J.K. Rowling‘s wonderful creation, Pottermore. The author regularly releases old drawings of her characters from way back when – but recently, one in particular is causing quite a stir in the Harry Potter fandom. In and old illustration entitled ‘Draco’s Duel’, Harry, Ron, Hermione and Neville Longbottom can all be seen in the corridors of Hogwarts. 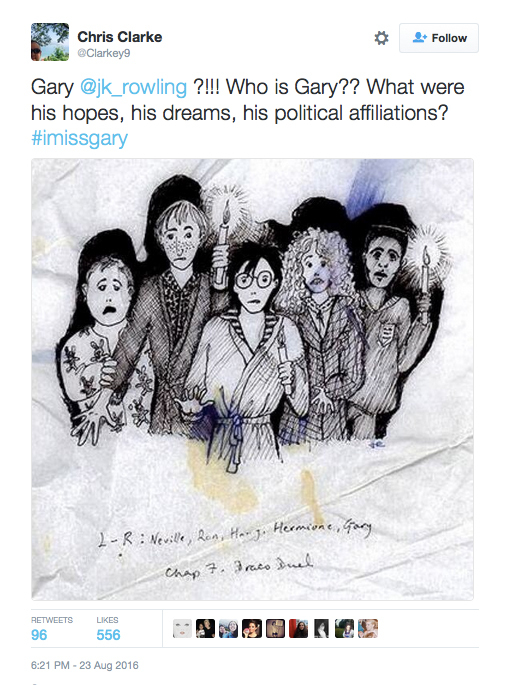 But on the end, according to J.K. Rowling’s annotations, is a student named Gary. Wait a minute. Gary? We certainly don’t remember a student called Gary hanging around with Harry, Ron and co. Eh? When did this happen? Are we perhaps not the die-hard Potter fans that we thought we were? So many questions. Naturally, soon enough the whole thing was put to J.K. Rowling herself on Twitter, to try to get to the bottom of Gary’s identity once and for all. It’s no secret that she’s a bit of a legend on social media – here’s every time the Harry Potter author won at Twitter. As it turns out, Gary’s character is actually pretty well-known to us – he just happened to get a little name change before the publication of The Philosopher’s Stone. 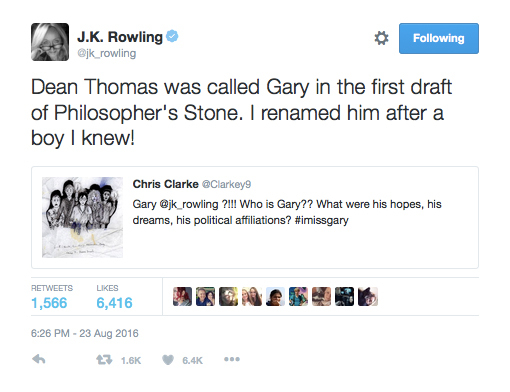 J.K. responded to the eagle-eyed fan’s tweet, letting us know that in earlier drafts back in the day, Dean Thomas was in fact called Gary. Well, who knew, eh? As well as educating her many fans, the whole incident reminded J.K. Rowling herself of Dean’s name-change, as she later tweeted: ‘I’d forgotten I called him Gary until I saw that pic just now!’ Classic. Little Harry Potter gems like this never fail to surprise and entertain us – there is so much more for us to learn about the wizarding world. Keep ’em coming, J.K.